Immerse yourself in the spectacular visuals and dynamic content of Principles of Human Anatomy, 14th Edition. 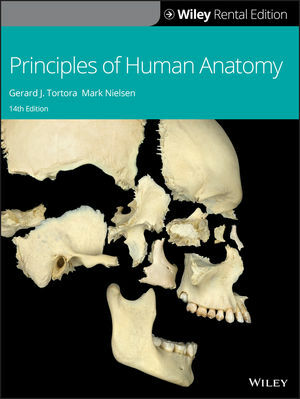 Designed for the 1-term Human Anatomy course, this 14th edition raises the standard for excellence in this discipline with its enhanced illustration program, refined narrative, and dynamic resources. Principles of Human Anatomy is a rich digital experience, giving students the ability to learn and explore human anatomy both inside and outside of the classroom. Gerard Tortora is Professor of Biology at Bergen Community College in Paramus, New Jersey, where he teaches human anatomy and physiology as well as microbiology. He received his bachelor’s degree in biology from Fairleigh Dickinson University and his master's degree in science education from Montclair State College. He has been a member of many professional organizations, including the Human Anatomy and Physiology Society (HAPS). Gerard is the author of several best-selling science textbooks and laboratory manuals, a calling that often requires many additional hours per week beyond his teaching responsibilities. Nevertheless, he still makes time for four or five weekly aerobic workouts that include biking and running. He also enjoys attending college basketball and professional hockey games and performances at the Metropolitan Opera House. Mark Nielsen is a Professor in the Department of Biology at the University of Utah. For the past 31 years he has taught anatomy, neuroanatomy, embryology, human dissection, comparative anatomy, and an anatomy teaching course to over 25,000 students. He has prepared and participated in hundreds of dissections of both humans and other vertebrate animals. All his courses incorporate a cadaver-based component to the training with an outstanding exposure to cadaver anatomy. He is a member of the American Association of Anatomists (AAA), the Human Anatomy and Physiology Society (HAPS), and the American Association of Clinical Anatomists (AACA). Mark has a passion for teaching anatomy and sharing his knowledge with his students. In addition to the many students to whom he has taught anatomy, he has trained and served as a mentor for over 1,200 students who have worked in his anatomy laboratory as teaching assistants. His concern for students and his teaching excellence have been acknowledged through numerous awards. Concept Videos by Mark Nielsen provide a great resource for faculty who want to incorporate more of a flipped classroom into their teaching. They are also a great resource for students, by helping them focus on key concepts and patterns in anatomy. The changing landscape of higher education means today’s educator must increasingly do more with less. Wiley can help ease this burden put upon instructors, and also help students develop skills, like reading, studying, and critical thinking, increasing their ability to be successful in the classroom. Real Anatomy 2.0 is a 3-D imaging software that allows students to dissect through over 40 layers of a real human body to study the anatomical structures of all body systems. Using Real Anatomy, students can interact and practice with a real cadaver as much as they need from the comfort of their own computer.